Earlier this month, Science World hosted “Community Access Day” for individuals and families with autism across the Lower Mainland. Offering free admission, Science World hosted hundreds of Canucks Autism Network (CAN) members throughout the day. Children, youth and young adults with autism, along with their families, explored Science World’s full range of attractions — igniting their imagination through exhibits like The Science Behind Pixar and the award-winning Ken Spencer Science Park. Among Science World’s core values is a commitment to both collaboration and inclusion. At CAN, we are dedicated to improving accessibility for individuals and families living with autism in all community spaces. That’s why for the past three years, we have partnered with Science World to bridge the gap for individuals with autism to experience the wonders of science and nature. In addition to their Community Access Days, we have partnered with Science World to develop accessibility resources, host autism-friendly events and provide staff training. It is no secret that Science World has been a leader in igniting wonder within the Vancouver community. With numerous initiatives over the course of several years, it is clear that they are also on the leading edge for increasing accessibility and inclusion. During Autism Awareness Month in April 2016, CAN and Science World collaborated to create an Activity Storybook for individuals with autism that may wish to visit the venue. Designed to increase predictability, the Activity Storybook outlines what individuals with autism can expect from a visit to Science World. 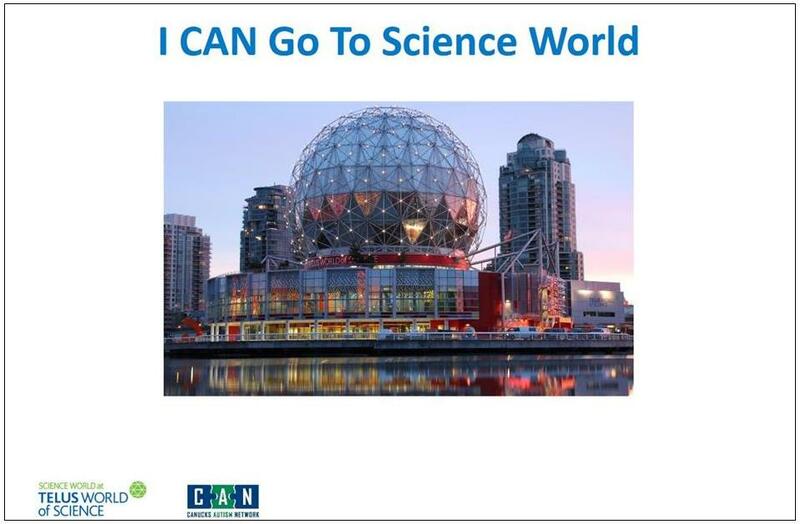 Check out “I CAN Visit Science World” for your next trip! The Science World Activity Storybook illustrates the process of visiting the facility, from paying for your pass to what each exhibit entails. With a desire to better support individuals with autism that walk through their doors, Science World reached out to CAN to receive autism training. In January 2016, our training team visited Science World to deliver a customized autism training workshop on site. The dozens of Science World staff and volunteers in attendance received an introduction to autism and a wide range of support strategies and tips for better interacting with individuals with autism. Learn more about CAN autism training workshops. CAN staff have delivered autism training workshops to Science World staff on multiple occasions since 2016. 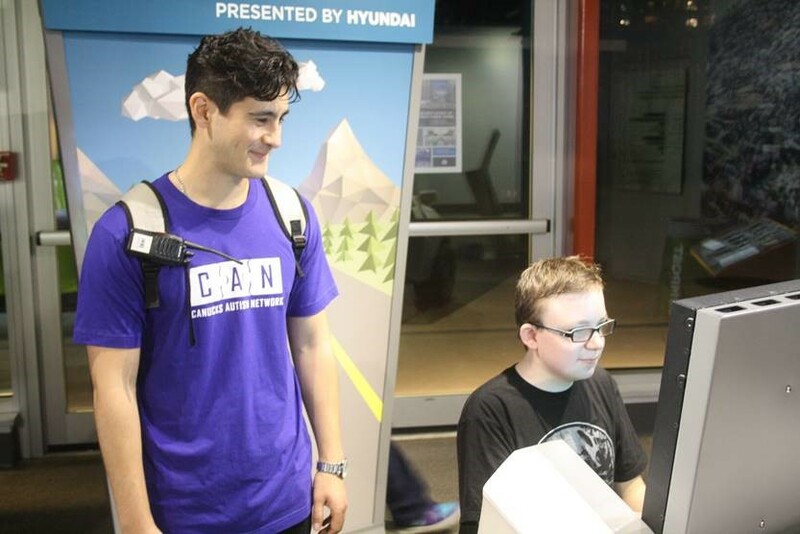 With the assurance that Science World provides a safe and supportive environment for individuals with autism to visits, CAN has hosted countless Monthly Social Program events over the past several years. In groups of 10, our youth and young adult participants have enjoyed the countless exhibits with the support of our staff and volunteers. Meanwhile, our CommunityWorks! Canada ® program, which provides volunteer opportunities to youth and young adults with autism, has also visited Science World on a number of occasions to assist their staff with various tasks. These visits have provided them with valuable volunteer experience with a well-known organization in the community. Having partnered together to create resources, provide training and host events, Science World and CAN co-presented on “Creating Opportunities for Accessibility” at the 2017 Lower Mainland Museum Educators (LMEE) Conference. Organizations like Science World are committed to accessibility and inclusion, and are key partners in CAN’s vision that individuals with autism are understood, accepted and supported in all community spaces. If you are a similarly-minded organization or community group that would like to learn more about increasing accessibility for your guests, we would love to hear from you! CAN supports accessibility in a wide variety of public spaces by providing consultations and creating customized solutions. These can include, but are not limited to 1) staff training, 2) developing accessibility resources (such as the Activity Storybook), and 3) partnering to co-host autism friendly events. To learn more about accessibility at Science World, visit scienceworld.ca/accessibility. To learn more about partnering with Canucks Autism Network to make your organization more accessible for individuals with autism, contact our Manager of Training, Hallie Mitchell, at [email protected] or 604-685-4049 ext 219.